Author: Anne Storch. Series edited by: Herrmann Jungraithmayr, Norbert Cyffer. 21 pp. Roman, 412 pp. The study presents the first description of Hone, a language which is spoken in north-eastern Nigeria, thus being the northermost Jukunoid language known. The Central-Jukunoid languages are the most typologically diverse group of Benue-Congo languages, some of which have only rudimentarily been documented so far. Throughout the linguistic debate on African languages they have often served as a model to describe the process of the development of secondary suffix sets out of the former systems of prefix sets. The Hone language has preserved numerous set prefixes in petrified form, a phenomenon which allows for more precise insight into this aspect of the linguistic history. The present book is divided into two major parts: the first part comprises a grammatical description of Hone which is enriched by numerous information about cultural and contact history. The author first describes the grammatical structure of Hone, which is marked by an innovative phonology, particulary in terms of its vowels, and a rather conservative morphology. Besides the description of the Hone phonology and its nominal and verbal morphology, also the pronominal system, further word categories (numeralia, ideophones, interjections, etc. ), and the syntactic structure are outlined. The second major section is a historical-comparative description of major developments especially in the system of nominal sets. The author here contrasts the Hone findings with comparable findings from other lesser or as yet undocumented Central-Jukunoid languages, thereby also discussing the possibilities of typological change in an exemplary way. In this way, the major historical language developments in phonology, nominal morphology, and the lexicon are described. A list of word-stems containing some 150 glosses completes this section of the study. The dissertation concludes with a summary of the results of the comparative historical research, which allow for conclusions applying to problems of reconstruction and classification. Beschreibung und Vergleich bestechen durch die Breite des verwendeten Materials sowie durch eine sorgfältige und umfassende Analyse. Anne Storch wird damit ihren beiden Zielen gerecht, sowohl eine gründliche Beschreibung des Hone vorzulegen als auch ausgewählte historische Entwicklungen im Zentral-Jukunoid zu dokumentieren. The book is a detailed description of the morphology of Hone and a comparative study of Central Jukunoid phonology, morphology, and noun class system. [...] Because Storch has provided a detailed list of grammatical morphemes, paradigms to which those morphemes belong, and their possible arrangements within larger lexical and phrasal constructions, the work constitutes a necessary prerequisite for any future reference grammar of Hone, where the functions of grammatical morphemes and syntactic constructions are described on the basis of natural language data. The presentation of grammar is relatively free of obscure formalism and can be used by any researcher working on this language or on comparative Jukunoid. 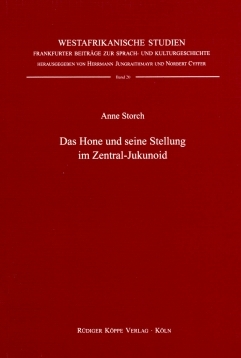 Storch has contributed significantly to the scholarship of Jukunoid languages by disentangling the complex morphological system of Hone. The study is a Ph.D. thesis written under the supervision of Prof. Hermann Jungraithmayr. Its importance goes far beyond the requirements which are to be fulfilled in order to obtain this scientific degree. It seems to be a mile-stone on the way of the Jukun research and classification.